The old saying goes that “the walls have ears,” something similar can be said about computers. It seems like every day brings another data breach, malware or phishing attack – leading one to believe that the Internet has eyes and nothing is safe there – especially not your bank account or online storefront. Cyber criminals and virtual thieves go to extreme lengths to get into your online pockets: phishing sites, fake banking sites that look real, tools to log your keystrokes on your keyboard, SMS hijacking for one-time passwords and more. Of course, this dreadful situation could be remedied by taking some simple precautions, like shopping at only trusted online merchants, using web-banking tools fortified by two-factor authentication, or never telling anyone the account number or your payment card PIN. However, even the most careful users might discover one day that their money is gone, as cybercriminal nowadays are cunning and savvy. 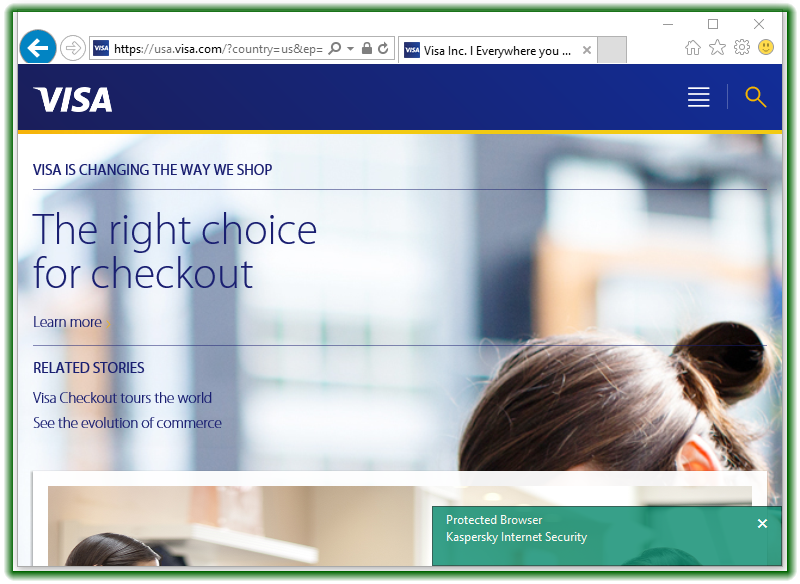 You could also resort to another option – completely refusing to shop or bank online. 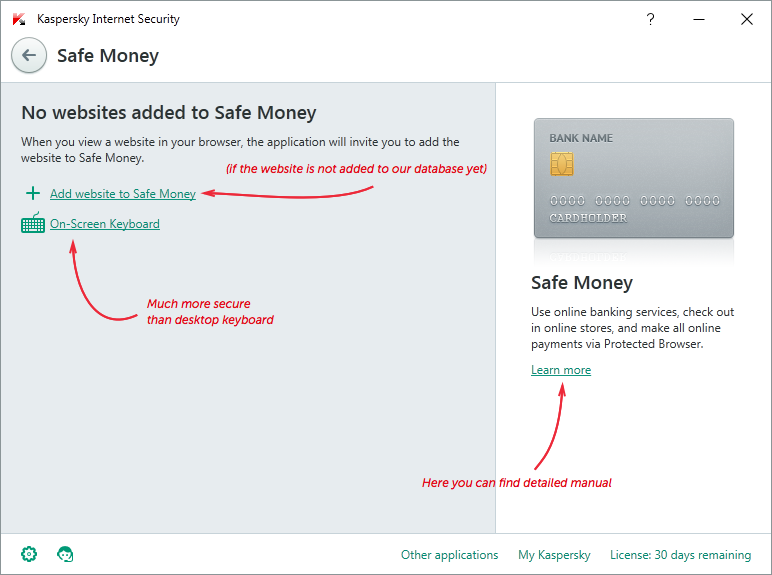 That is drastic and we’d like to offer a better solution: install Kaspersky Internet Security 2016 and activate the Safe Money option. If this frame is not green but yellow, use tips in the lower right corner or recommendations from Safe Money section in our knowledge base. 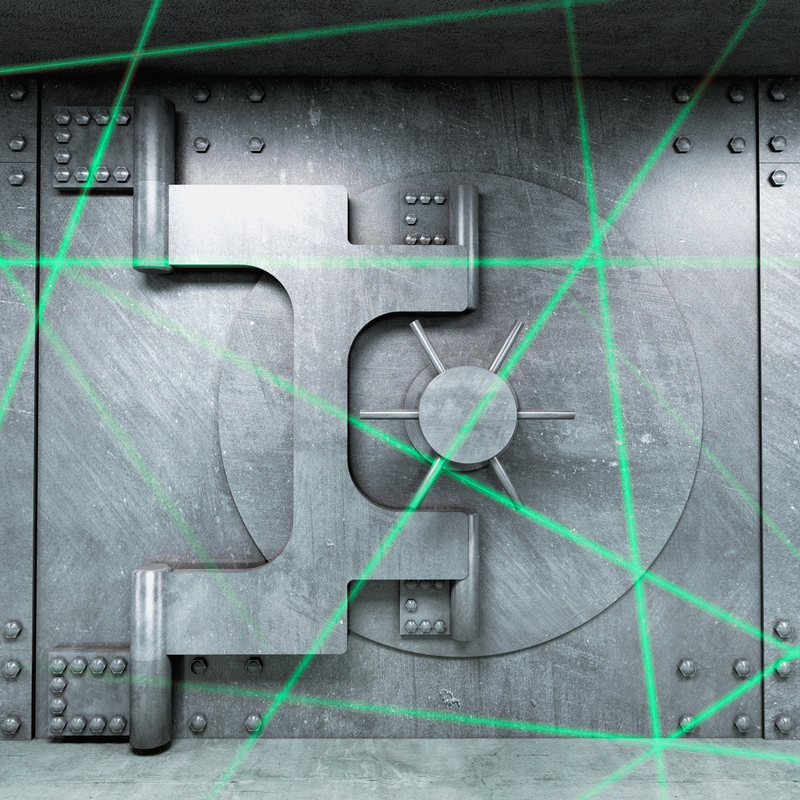 Here you can use On-Screen Keyboard to input the data securely or jump to the designated entry on Safe Money in our Knowledge Base. Should you want this website to open in the Secure Mode, choose the Run Protected Browser option. Or, if you for some reasons want the site not to be opened in the Secure Mode, use the reverse option: check the Do not Run Protected Browser button. Should you want to change preferences for a particular website, pick the Prompt for Action option. 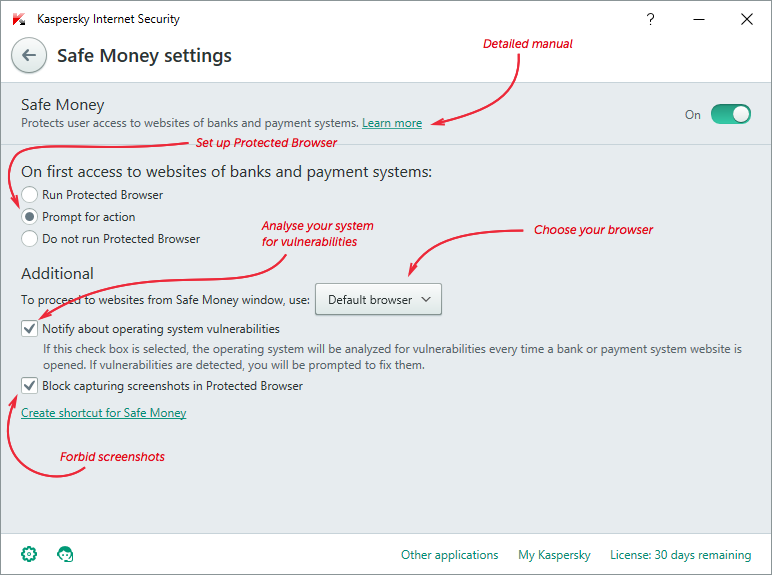 Once the page with parameters is launched, you can: choose action on first encounter with a finance-related website, you can choose: a default browser; prohibit or allow the screenshot capability; or launch a check for vulnerabilities. 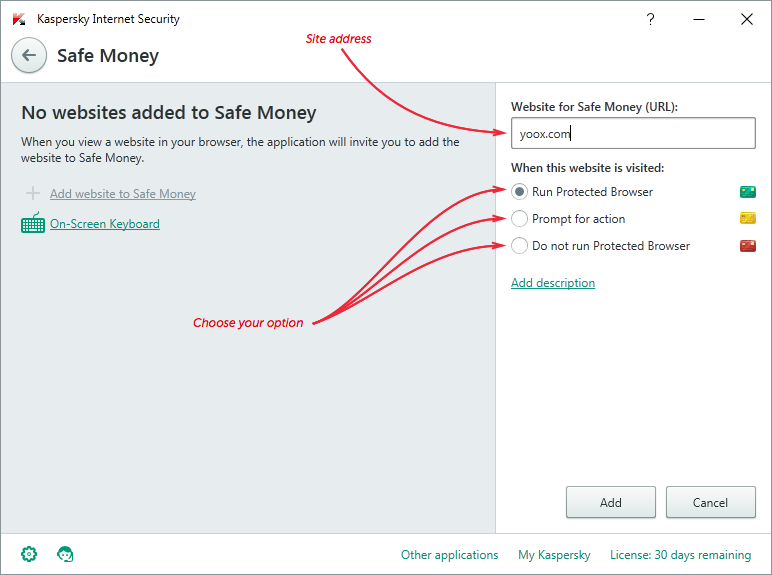 Moreover, you can jump directly from the program window to the article on safe payments on the support site. While today’s cybercriminals have developed the means to peep on PC displays, Kaspersky Lab experts learned to impose borders for these culprits to save our precious data from prying eyes. 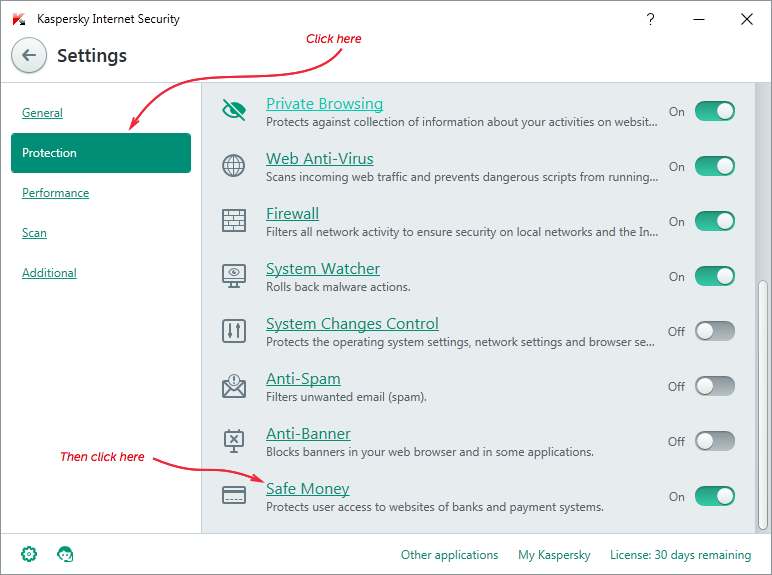 With Safe Money option in Kaspersky Internet Security you can rest assured that you financial information is safe from fraud.